Marie Kondo is NOT telling you to throw out all your books. If you’ve watched either her Netflix show or read her books, she is telling you to be mindful of about what you take into the future with you. For some people, that is going to mean taking 1,000 books with them. For some, that number is going to be 5. But it’s okay, Marie Kondo is not coming for your books. And neither are The Minimalists. I’m not really sure how these things get started, but I have seen a lot of people freaking out under the assumption that Marie Kondo (or her KonMari Method) wants people to toss their books in the garbage. I’ve seen the meme going around that suggests an ideal number of 30 books on the shelf which has people very agitated and ready to call Marie Kondo “evil” for the suggestion. But I’m here to tell you, you can tidy up, follow your bliss, spark joy and be a minimalist and still keep all of your books, some of your books, two of you books, whatever. It’s not about the number, it’s about what you value. What Did My Books Say About Me? Up until about a year ago, I was someone who had a great deal of their identity wrapped up in her book collection. I always had dreams of a vast library (complete with moving ladder) that welcomed me home. I love books. I love the way they feel, smell and look on the shelf. I also loved what I thought having all those books said about me – I wanted people to see that I was well-read and had a wide range of interests. In short, there was a lot of my ego wrapped up in all of those books. I had two huge wooden shelving units, one tall bedroom unit and one short, long unit filled to the brim with books when I moved into my apartment in Los Angeles. I moved those books from New Jersey, Boston, Washington, D.C. and Ohio. All totaled, I spent thousands of dollars moving books. And I did it again. When Andy and I moved into the new place, we added two more bookshelves to the mix with Andy’s books. But the way the spaces are broken up in the new place, I started to feel claustrophobia rather than joy. Most of those books had not been opened in a decade. More of those books had not been perused in 25 years. The out-of-date textbooks were not reference sources for my career. The old Russian, Spanish and French language books felt like an accusation when I looked at them, which was not often. I had copies of books that I hated. That’s right – I paid to move books that I hated. The Minimalists talk more about the things that you find valuable in life rather than “sparks of joy,” but it comes down to the same thing. I had to go through every one of those books and decide if they brought value to my life. I wanted to be ruthless, but that was impossible. Again, too much of my ego was part of this collection. There are some books I read every year. Those were staying. There are some books that I haven’t read in years but are works that I love and those that represented a new discovery. Those were staying. Books I hadn’t read yet remained. Special books my mother gave me are still on the shelf. But hundreds of books took their leave over the course of the last year — not because of Marie Kondo, but because they no longer fit my needs. And I feel better about them being read by new people who can appreciate them rather than staying dusty on my shelf. I refuse to throw out books (most of the time). I understand that you might need to throw out books that have food or water damage on them, but if they are in good condition, consider donating them. I started with a yard sale. All of my Penguin Classics were snatched up at the beginning of the day despite my highlights from junior and high school classes. It turns out that teachers need to keep extra copies of books in their classrooms for new kids or book short-falls. Had I known, I would have just given them to the person who bought them, but I didn’t find out until later who she was. So, note to everyone out there, if you are getting rid of books that are taught in schools, find out if you can donate them to classrooms. Did you know that some senior centers have libraries? If you have popular, paperback (or hardback) books that you don’t plan on keeping, consider contacting your local senior center to see what their needs are. Veterans groups often accept books, as well, but be sure to ask them before packaging them. One of my most significant donations went to the Friends of The Robertson Library book sales. They sell used books that are in good condition twice per year to help finance their own acquisitions and activities. And if you happen to be donating something they can use, they may also add it to circulation. Do you have the Little Lending Libraries in your area? These are the mini-libraries you see on tree lawns in residential areas. 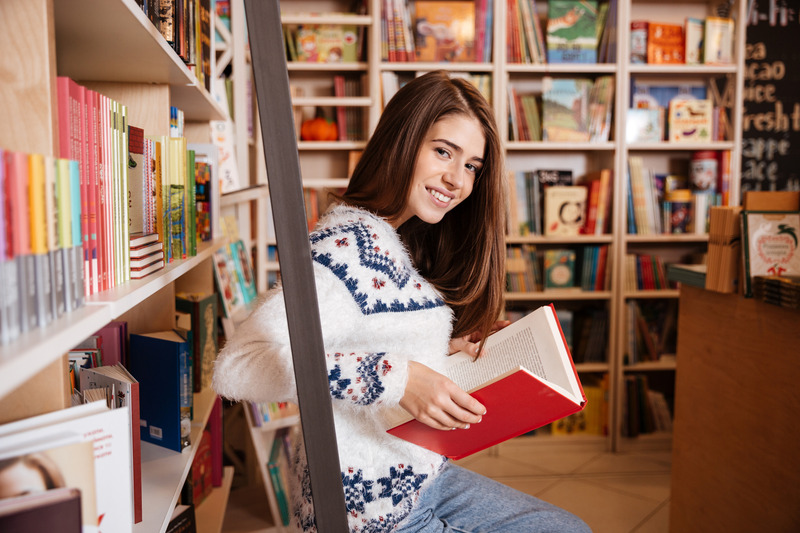 For the most part, these are also great places to offer up popular books. Plus, if you see something there that you want to read, you can swap it out for one of the books you are donating. I tend not to donate books to places like Goodwill or the Salvation Army. While some of your local ones might take them, many do not. That seems like a waste when so many other places do want your used books. Naturally, if you have the time and patience, you can also sell through Amazon, eBay and textbook companies. I have fewer than 50 books now. Every book is either something I love, something I need or something I have yet to read. Andy also got me a Kindle to make traveling with my current reads much easier. It took me years to give in to the digital read, but I certainly understand its appeal now. We sold or donated three of the bookcases, and the office is progressing toward a much more useable writing space. Did I get rid of my books because Marie Kondo or The Minimalists told me to? No. I curated my collection to reflect what I want to take into the future with me. For every person, that number is going to be different. And that’s okay.